East Dorset District Council: Pure Town Planning are thrilled to announced that we have won an appeal in the South East Dorset Green Belt for significant extensions (over 50% floor area) to an existing chalet bungalow. 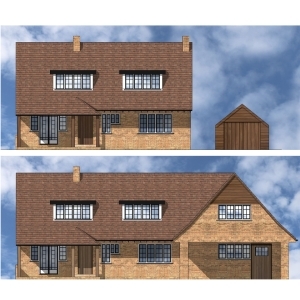 The appeal proposal comprises the demolition of the existing garage and workshop and the erection of a 2 storey side extension incorporating a car port and workshop. The proposal has been driven by the owner’s aspiration to extend the existing dwelling in a sensitive manner to create a modern functional family home. The proposal provides a reasonable sized master bedroom, living room, kitchen, car port, workshop and a further 3 bedrooms. The plans were prepared by BeMa Architects. The application was refused planning permission by East Dorset District Council because the extensions exceed the ‘50% rule’ set by Policy GB3 of the Local Plan and therefore constituted inappropriate development within the Green Belt. As part of the appeal submission, we argued that the Council failed to have regard to Section 38(6) of the Planning and Compulsory Purchase Act 2004 which states that “planning applications must be determined in accordance with the development plan for an area, except where material considerations indicate otherwise”. In this instance, whilst it was acknowledged that the proposal exceeded the ‘50% rule’, the harm to openness of the green belt caused by the proposed two storey extension should have been assessed against the harm caused by the permitted development scheme. We argued that as the permitted development had a significantly greater floor area when compared to the planning application (366.4 sqm v. 278.8 sqm) the permitted works would cause significantly more harm to the openness of the greenbelt than the appeal scheme. In addition, the permitted works would concentrate built form across the width of the plot, as opposed to just the eastern side under the appeal proposal, arguably this would be detriment to the rural character of the area. In assessing the proposal and our arguments about the appellant’s fall-back position, the Inspector stated the following, “Compared to the appeal scheme, the fallback scheme would have a far greater spatial and visual impact on this part of the Green Belt. The three separate extensions combined with the three outbuildings, as well as the new driveway, shown on the fallback, would result in a significant encroachment and intrusion into the Green Belt. I am satisfied that, on balance, the consequent harm to the openness of the Green Belt would be far greater with the fallback than with the appeal scheme.” The appeal was subsequently allowed with the Inspector concluding that whilst the proposal constitutes inappropriate development in the Green Belt very special circumstances exist to justify the grant of planning permission. If you own a property within the Green Belt and would like to extend then why not call Pure Town Planning on 01202 585524 or email info@puretownplanning.co.uk for a FREE 30 minute consultation on how we can help you.